Dear Valued Guest, Warm Greetings from Antilog Vacations...!!!! Thank you for giving us the opportunity to let us plan your holidays. Over the years, not only have we changed the way people travel but in a relatively short period of time, have grown to become India’s largest online travel company. This growth stems from the belief instilled in all of us. You, the customer, come first ! With this promise from all of us to make your holiday an unparalleled experience, we are pleased to present to you a memorable holiday tour plan. Welcome to Paris – The capital city of France and a global center for art, fashion, gastronomy and culture. On arrival, your Tour Manager / Local Representative will welcome you outside the customs area for a warm meet & greet and take you to your hotel (Check-in time is after 2.00 pm). Later in the evening, Illuminations Tour of Paris. Experience the magic of Paris after dark and marvel at the illuminated monuments of the French Capital and soak in the fairy-tale atmosphere created by the illuminated monuments, fountains, and bridges. An outstanding concentration of 180 museums and monuments await you … Make the most of it. Visit the city center as your experienced tour manager/guide tells you about the various monuments and neighborhoods. See the Arc de Triomphe, the Champs Elysées, Concorde, Madeleine, the Opera House, the Latin Quarter, the Orsay Museum and the Alexandre III Bridge. Continue your journey in Paris at the Eiffel Tower while you will hear tales as you walk and learn about its creation. After you pass the 2 security controls, you will head straight up to the second floor by elevator. You will also walk around the viewing gallery and soak up sights of Champs de Mars and Montparnasse Tower. You may want to take an optional the Seine River cruise with music. Admire the splendid architecture of the heart of the city's most prestigious monuments that line the Seine: the Louvre Museum, Notre Dame Cathedral, the Orsay Museum, the Conciergerie, etc. Relax on the fully-glassed boat with terrace and glide along as you experience Paris from the river. 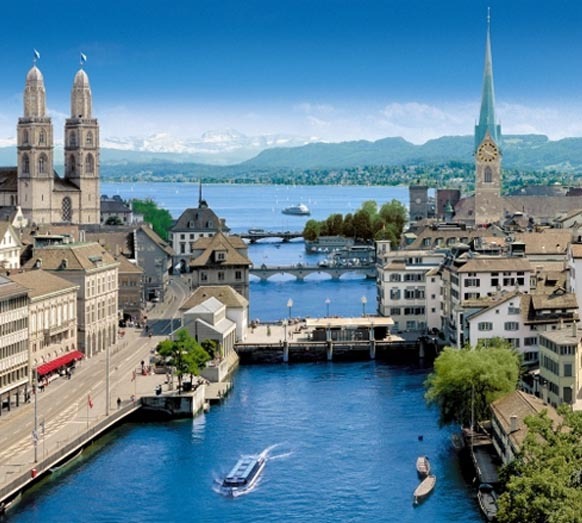 After an early breakfast board your coach to travel through the beautiful scenic route for Zurich via an orientation tour of the city of Basel - situated on the Rhine River in northwest Switzerland, close to the country’s borders with France and Germany.Upon arrival in Zurich, check in at hotel. 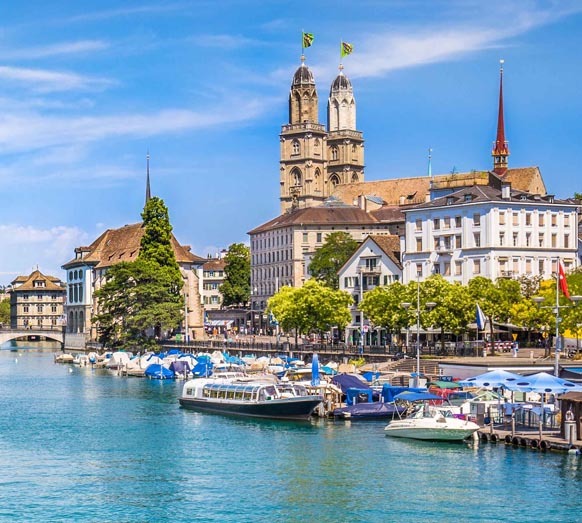 After a short while, we will proceed for a guided tour of the city, such as the gorgeous Old Town and the Swiss National Museum, built in the style of a Renaissance chateau. Discover the Münsterhof square and adjacent guild houses on a short orientation walk through the old town with your tour guide. See St. Peter's Church, which boasts the largest clock face in Europe and learn something about the Fraumünster church's exciting history and architecture. A further tour highlight is the Swiss Federal Institute of Technology in Zurich, one of the highest-ranked engineering colleges in the world. Its most famous student was none other than Albert Einstein. After breakfast, proceed for full day tour to see and discover a fascinating glacier world and beautiful landscape of eternal ice and snow on Titlis Mountain as well as orientation tours of Lucerne and Engelberg. We will drive over the Albis Pass and along the shores of the magnificent Lake Lucerne on the way to the city of Lucerne. Once there, take a short tour of the city's most important sights, including a photo stop at the famous Lion Monument or Vierwaldstätter Lake, depending on traffic. Afterwards, enjoy some free time to take an optional sightseeing cruise on the Lake Lucerne. From Lucerne, we will continue on the tour by driving to Engelberg. The breathtaking ride up into the high alpine glaciers of Mount Titlis begins here. From the Rotair revolving cable car on your way up to mountain, you'll get spectacular views of the deep crevasses in the glaciers, and the immense chunks of ice that break off in spectacular fashion. Take your chance to enjoy fantastic views over the Swiss Alps from the Panorama Restaurant on top of Mount Titlis. Visit the Ice Grotto, or take the Ice Flyer chairlift to get up close to the spectacular glaciers at an altitude of over 9,800 feet (3,000 meters). After breakfast, board your coach to embark on a beautiful scenic journey from Zurich and crossing the Swiss border to enter Italy. Arrive in Lake Como and then to Milan. The scenic town of Como - Located on the shores of Lake Como - this is a popular resort area for aristocrats and celebrities since Roman times, known for its dramatic scenery, set against the foothills of the Alps. Lake Como is also the charming Italian town where our very own Indian Business Tycoon Mukesh Ambani’s daughter’s engagement and Bollywood Stars Ranvir and Dipika’s Marriage ceremony took place. Later, travel further for an orientation tour of Milan. See the famous Duomo, one of the finest examples of Gothic architecture in Italy, La Scala Opera House and the Galleria Vittorio Emanuele II, one of the world’s oldest shopping malls. After lunch, we will travel further to Padua via Verona - city in northern Italy’s Veneto region, with a medieval old town built between the meandering Adige River. It’s famous for being the setting of Shakespeare’s "Romeo and Juliet." After breakfast, proceed for a Day tour of Venice and to Murano, Burano and Torcello islands. 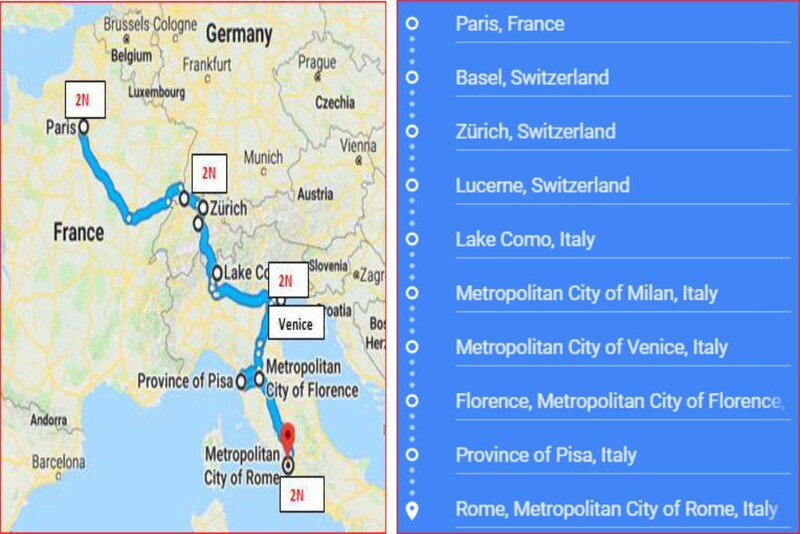 We will drive to Venice, the romantic Italian city known for its unique architecture. Drive over Mussolini’s Bridge of Liberty and then take a private boat to St. Mark’s Square, the very heart of Venice. After breakfast, drive to Florence and proceed on a guided walking tour of the city during which we see the Magnificent Duomo, the Baptistery and Giotto’s Bell Tower. We then walk towards Piazza Signoria to see the Palazzo Vecchio, the Logia and the Equestrian statue of Cosimo. Proceed to Pisa, where you will see the incredible Piazza dei Miracoli, most famous for its “Leaning Tower.” After that, visit the town's many other historical monuments, including its majestic cathedral, before grabbing a cappuccino and heading back and travel to Rome - the eternal capital city. Rome is a sprawling, cosmopolitan city with nearly 3,000 years of globally influential art, architecture and culture on display. Ancient ruins such as the Forum and the Colosseum evoke the power of the former Roman Empire. Arrive into Rome and check in at hotel after freshen up evening proceed for Rome night city tour. Take a panoramic drive in a magical night-time atmosphere of Rome. 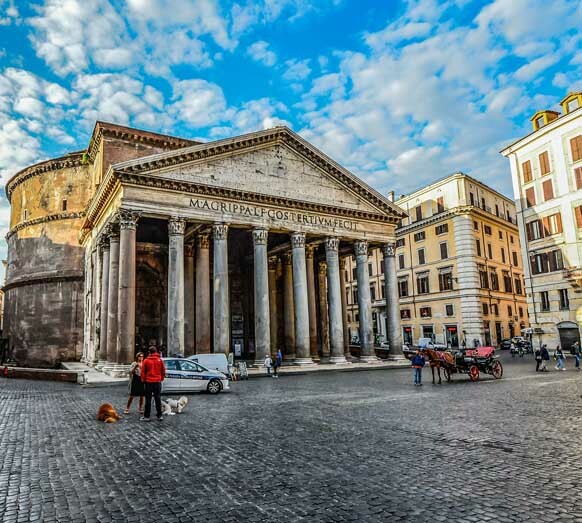 Along the way around the city we will have some short stops in order to take some photos, as well as get a closer look at some of the monuments, such as the Spanish Steps, the Colosseum, Trevi Fountain, Saint Peter Basilica, and many more. Be amazed by the lights of the multiple bridges on the River Tiber and travel down the elegant Via Veneto of “La Dolce Vita”, famous for its paparazzi memories. After breakfast proceed for half day tour to Vatican Museums, Sistine Chapel and St Peter's Basilica. During this guided tour, we will see Piazza Venezia, the colossal Victor Emmanuel II Monument, built to commemorate the 50th anniversary of Italian reunification. Further, we will witness the gigantic Colosseum - symbol of Rome and visit the Trevi Fountain to click some nice photos and capture the moments. Later, we will visit the Vatican museum with Sistine Chapel - the private chapel of the Pope. You will see “The Last Judgment” painted on the altar by the renowned artist Michelangelo. Also Visit St. Peter’s Basilica, the world’s largest Cathedral. Please note that a correct outfit is required for Cathedral inside visit. Shorts, off shoulder dresses, miniskirts, etc. are not accepted. Today after breakfast, we check out and board the coach for a transfer to the airport to board the flight back home. It’s time to say goodbye and take back many happy memories of your holiday. We hope you enjoyed your Holiday as much as we enjoyed bringing it to you ! Departure Date:25th March, Valid Prior 45 Days Of Departure Date. *Payment will be charged in the breakup of Euro & INR as per the given breakup. Should you wish to make the complete payment in INR, Euro will be charged as per the prevailing ROE on the day. Price with 3* Hotel Options : Cost mentioned is per Person in INR. Valid prior 45 days of departure date. Price with 4* Hotel Options : Cost mentioned is per Person in INR. Valid prior 45 days of departure date. Schengen multiple entry visa charges. Excursions and sightseeing as specified in the itinerary. Surface transportation as mentioned in the itinerary by a comfortable and modern European LDC. Any increase in the airfare / taxes / routing charged by the airlines for tickets (presently calculated as on 21 Jan 2019). Local City Taxes, Porterage at hotels, apartment, airports and seaports, tips, laundry, wines, mineral water, telephone charges, all items of personal nature and also food and drinks not forming part of the touring group's menu. Any increase in rate of Euro (presently calculated at 1 Euro = 80 INR, as on 15 Jan 2019) leading to an increase in tour cost coming into effect prior to departure. However, the rate prevailing on the given day of payment will apply. Cost of any Suggested/Extra Excursions or activities. Single room supplement extra per person to be checked at the time of booking. *As a 3rd in a triple, a roll away cot may be provided. ** As a 3rd in a double, no bed or cot will be provided to the child. Person below 12 years will be considered as a Child. Maximum 3 persons are allowed per room. We take extra care to select hotel locations in either the city centre or away from it depending on the tour journey and availability. Hotels generally do not have air conditioner or fan due to favorable weather condition. As hotel rooms are smaller we recommend maximum 3 persons in a room for your own comfort. Triple rooms are usually no larger than twin rooms. Surcharges applicable during Peak and Event periods. Breakfast / lunch / dinner wherever provided on tour is on pre-set menus. Tour Participant shall intimate the booking agent for special meal or specific diet while booking and if it is feasible we will try to provide them. We however, reserve our right to change the meal arrangement where circumstances compel us to do so. If meal/s are missed by Tour Participant at his/her own will or due to late/non arrival at announced meal timing, no compensation for such missed meal/s will be given. We use air-conditioned / air-cooled luxury coaches. We find it fair to enforce daily seat rotation in the coach and hence do not allot seat number. 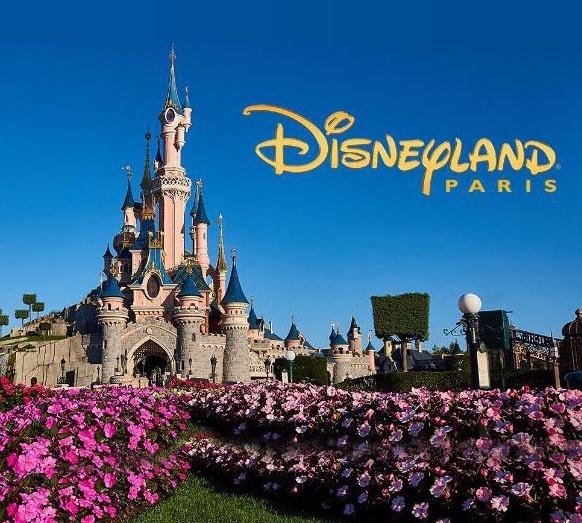 On Europe tours the daily travel time by coach is roughly 8 hours under normal conditions. You must be in possession of a valid Multi Entry Schengen Visa. The cost of this Visa is included in your tour price. Some Consulates may request for a biometrics/personal interview. You will have to attend this Interview at your own cost. It will be the Tour Participant’s responsibility to apply for visa with complete set of documents required by the embassy/consulate within the stipulated period as advised by the Company. In the event the visa application made by Tour Participant or by the Company on his/her behalf is rejected by the consulate due to either inadequate supporting documents or for whatever reason or where the visa could not be processed due to late submission ofapplication by the Tour Participant the Company shall not be liable for the eventuality and lead to forfeiture of booking amount paid and no claim whatsoever shall be entertained for the same. All cost, charges in respect of the said visa application shall be borne by the Tour Participant. Visa fees are non-refundable under any circumstances whatsoever. However, due to rejection of visa or non-processing of visa application due to any circumstances if the Tour Participant is unable to travel on the tour originally booked he/she shall have the option to postpone the tour to another available date or change to any other tour by paying shifting charges. 25% of the cost of Land Tour Package to initiate the booking. 50% of the remaining amount before 45 days prior to the travel date. Remaining full and final amount to be cleared 30 days prior to the travel date. Flight Amount : 100% ticket cost to book the flights. Then you have to clear remaining Land Package Cost (without flights) 01 month prior to your travelling dates via NEFT/Cash Deposit. For Air Tickets you need to pay full amount via NEFT / Cash Transfer as we will instantly book & forward the tickets to you at the same time. To book tickets we need full payment in below bank details +your passport copies. Credit Card Payments Note : Any amount after paying token amount as per the package cost , gateway charges of 2.5% will be additional, but no extra charges are there on NEFT/Cash Deposit/Cheque/RTGS. Note : We don’t sell only flights , we have break up cost for flights only if you will take total package with land arrangements with us. Date of booking to 45 days the cancellation charges will be 25% of the tour cost. Less than 7 days, Total amount will be forfeited and no refund shall be given. 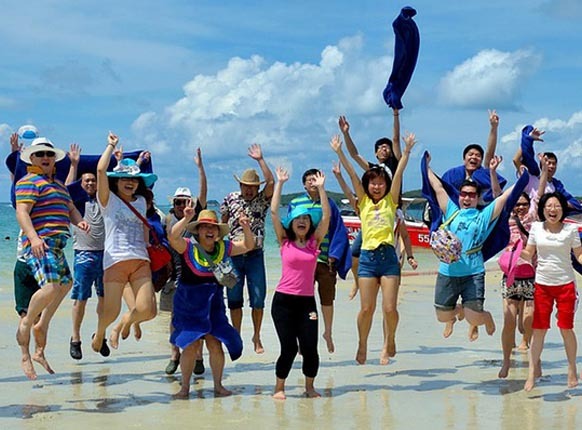 Minimum Group Size : All our group tours are operated with minimum 20 adult paying travelers. If the participation is below the minimum prescribed, the Company reserves the right to amend, amalgamate, alter, vary, or cancel a Tour without incurring any liability to pay any compensation. If Company decides to operate the tour with participation below the minimum stipulated the Company reserves the right to collect additional pro-rata amount. Change in Itinerary : We may operate more than one coach per departure date. For the comfort and convenience of our Tour Participants we may reverse the direction or slightly amend the itinerary which will be advised either at the start of the tour or on tour. In the event any Tour Participant misses part / whole of the sightseeing tour or any such tour due to delay / indisposition or any other reason whatsoever on his part, then he/she will not be entitled to claim any refund. Conditions of Travel : The Tour Participant will have to strictly follow the Tour Program and return to India as per the validity of the air ticket. Those Tour Participants not travelling with the group throughout the Tour shall under no circumstances be entitled to any refund. It shall be noted that for all purposes, it shall be the responsibility of the Tour Participant to reach the place of commencement of the Tour and register with the representative of the Company at the appointed place, date and time. Organizer Liability : The Company is a travel and holiday organizer. We do not own/control/operate any Airline, Cruise lines, Railways, Coach Company, Hotel or any other independent contractor or service provider in relation with services mentioned in this brochure/Website. Though we select all the ingredients, independent contractors, service providers for your holiday with due care we cannot assume responsibility for delay, deficiency or default if any in the services of such independent contractors, service providers, their management or staff leading to any injury/death/loss/damage to property or any such eventuality which do not fall within the scope of our normal selection and inspection process whilst engaging them. Refunds : Refunds (if any) for amendments and/or cancellations will be paid directly to you through the means you have forwarded your payment to us. It would take 45 days to process refunds. In cases where an airline ticket is issued, it would take 60 days to process the refund subject to clearance from the airlines concerned. In case of refund of Foreign Currency component, the refund shall be made in Indian Rupees only at the prevailing rate on the date of refund as per existing Rules and regulations. 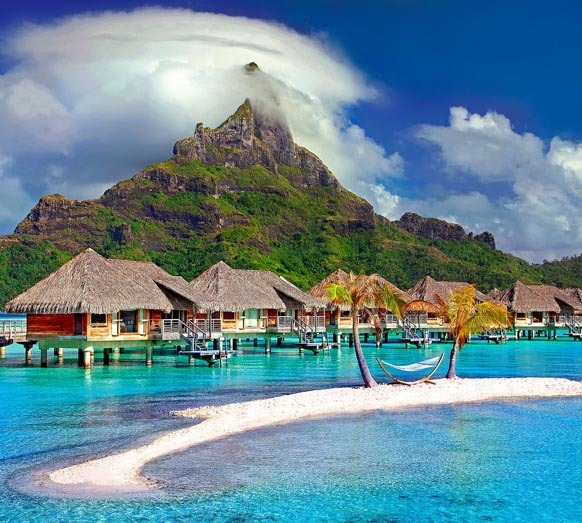 It is clearly understood that there shall be no refund whatsoever if you do not or cannot utilize any of the services like hotels, sightseeing, rides, cruises, meals, entrance fees, optional tours and the like due to any reason whatsoever. Customers are our asset. We are obliged to do the best for them. Customer satisfaction is valued a lot for us. We will give you the best advice and services for making your holiday a wonderful experience. Thank You And Wish You A Happy Touring ! More than 25% cheaper than the other operators in the Market. Completely built and developed In-house therefore, no third party vendor dependency or interference to give you a absolute tour experience. Need not to be bound with someone else’s t&c. More time utilization throughout not compromising on the comfort and quality. Travel with likeminded and fellow Indian people in a group. More inclusions and activities as compared to the other operator packages. Very comfortable itinerary giving ample time in each city as well as nearby places to explore and travel at ease. No rushing throughout the tour (No Long travel and 1 night stay at any place). Tour with meals (breakfast and dinner) with lunches on the go.